Seldom do Kickstarter projects look this good at the pitch stage. Doko Roko has immediately captured my attention. Allow me to explain why it deserves yours. Well, for a start, just look at this game! 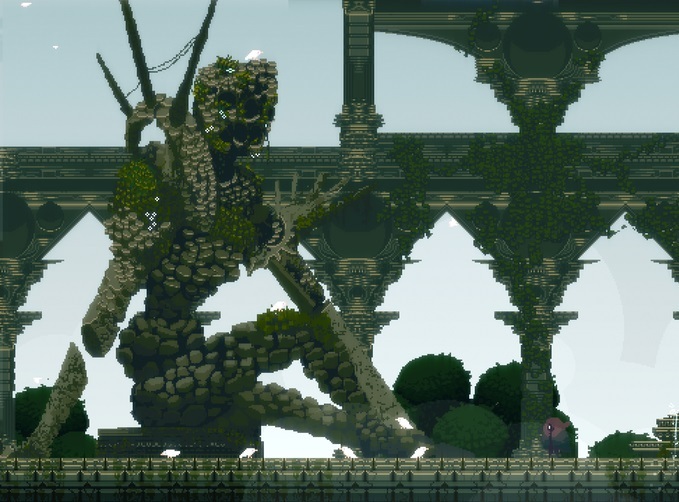 It’s beautiful, it’s smooth, and it has great art direction that’s seemingly inspired by the work of Fumito Ueda. But enough gushing praise, as I seem to be writing this article back to front – what exactly is Doko Roko? Doko Roko is the first game from art school dropout Eric Mack (whose self-taught digital painting classes have clearly paid off). A life-long gamer, Doko Roko’s Kickstarter page makes it sound as if Mack has almost fallen into this project, but his dedication is evident. A 2D action-roguelike with an emphasis on vertical progression, Doko Roko is the story of a towering ecosystem and the perils within. A lot of focus is being put into the game’s fiction, so here’s hoping it’s compelling enough to stand aside the fluid swordplay mechanics, which include dodging, parrying, striking, and reflecting projectiles. With Dark Souls listed as an example of good storytelling in games, it seems like Mack is aware that interactivity and exploration are more effective ways to engage players in a game’s world than forced exposition. It all sounds too good to be true. That’s my only reservation. And yet, at the same time, I’m looking at something that appears to be very special, even at this early stage. You have my support, Eric Mack. Hopefully, now that this article has been published, you’ll have even more. For more on Doko Roko, check out the game’s Kickstarter page. Both the game and its developer can be found on Twitter. Track the progress of the Doko Roko Kickstarter in our Campaign Calendar.